Welcome Emily to the studio maternity photographer blog! My gosh, isn’t she simply stunning?? Jaw dropping in fact. But my friends, it’s okay to still love her because she is so sweet! I loved meeting Emily at her maternity session! We had a lot of fun playing dress up and creating some timeless images for her to remember her second pregnancy with. A year ago, studio maternity sessions were not my thing. But after learning from Alli from Glow Portraits, the studio has quickly become my favorite place to do maternity sessions! This grey gown from Sew Trendy Accessories is the newest addition to my client collection of gowns. I love the color and shape of this one. And of course Emily rocked it, like she did everything! This dreamy lighting is by far my favorite for maternity sessions. Light, airy, and classic are my jam, friends. How cute is this blouse from AR Backdrops? It looks a little scary on the hanger but I am so glad my clients let me talk them into it. Emily brought some baby shoes to use during her session. 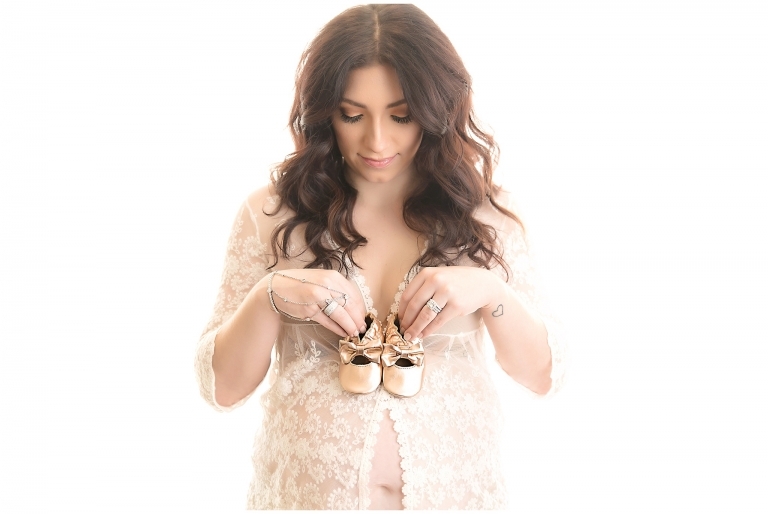 I’m kind of obsessed with those tiny shoes, her baby girl is going to be one stylish chic! Silhouettes are such a great way to capture pregnancy’s gorgeous shape. The intimate feel of these gives me all the feels. One day, Emily’s little girl will be able to see what she looked like in momma’s belly. How amazing is that? Thank you so much for stopping by the blog! Are you expecting and looking for a studio maternity photographer for your session? Please check out the portfolio and similar sessions on the blog. If you like the style of what you see, please contact me to discuss your maternity session!